It is made from solid mass of C.I which is lifted and allowed to fall under gravity on the pile head. It is provided with two lugs so that it may slide on the leads. It also consists of a hook to tie the rope to it. Drop hammer weighs 1 ton to 4 ton and has a free fall varying from about 1.5 to 6 m. It can deliver 4 to 8 blows per minute. The energy imparted to the pile head by the hammer is dependent on fall and weight of the hammer. Heavy hammer with short fall should be preferred than using light hammer and large fall. In this method, the hammer is lifted either with compressed air or steam but allowed to drop on pile head under gravity only. Its weight is about 2 ton and fall or drops from 1 m. It can deliver about 60 blows per minute. It can be open type or closed type. Single-acting steam hammer can be used for driving piles under water. In this method, the hammer is lifted by steam or compressed air like single-acting hammer but during fall steam or compressed air also aids the fall of the hammer in addition to the gravity effect. If compressed air is used for lifting and dropping the hammer on the pile head, it is known as pneumatic hammer. Double acting hammer weighs about 1/2 ton but because of added effect of steam pressure, it develops an effect of about 3 ton on the pile head. It can deliver 100 to 300 blows per minute. This hammer is generally fully enclosed in a steel case and hence equally useful for driving piles under water. In this hammer, energy per blow and number of blows per minute can be regulated by adjusting steam pressure. It is a modified form of double-acting steam hammer. Advantages of both single-acting and double acting steam hammers are embodied in it. It is claimed that this hammer consumes the least power in penetration of a pile as compared to single or double-acting hammers. It may be open type or closed type and hence can be used for driving piles under water also. In this method, piles are cast with jetting pipe in them. Water under a pressure of 7 to 17.5 kg/cm2 is forced through this jetting pipe at the rate of 20 to 40 liters per second near the bottom of the pile. This water dislodged the soil at the bottom of the pile and pile can sink under its own weight or with a very light blow of the hammer. Some water from the bottom rises along the sides of the pile and helps in reducing the friction between the pile and surrounding soil. 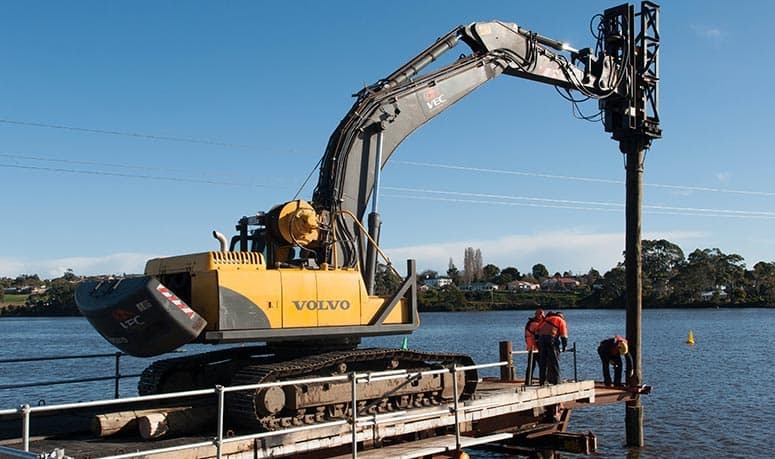 The water jet is stopped about 1 m to 2 m from the depth to be reached by the pile and this length is driven entirely with hammers. Piles may be driven by first boring a hole with the help of auger, rotary well drills or by any other method. Auger is used when the soil is soft and depth is very small. In case of rock and hard soils boring may be done by well drill or other methods. A precast pile is lastly put into the bored hole. Also Read- When And Where To Use Pile Foundation. Do you know any other methods of pile driving? Let us know in the comments section below.